The Bucs volleyball team are off to a hot start this season with a 13-2 record and major win over No. 22 Washington State. One player that has contributed more than her share this season is AJ Lux, a senior from Shelbyville, Indiana. 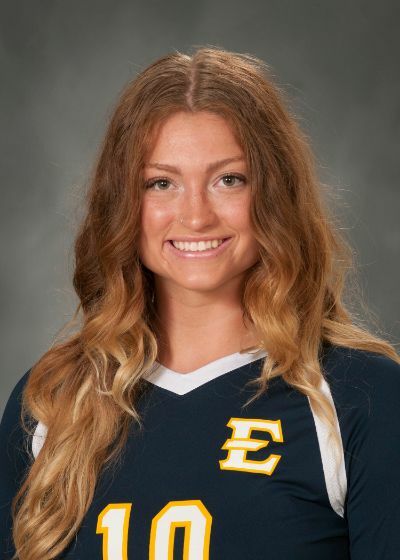 Lux came to ETSU with a group of freshmen teammates who, over the years, have jumped the ETSU volleyball program to new heights. Just as a freshman, Lux finished fifth on the team in kills with 89 as just a rotation player. Spectators raved about the power that Lux was able to generate as just a freshman. Lux showed head coach Lindsey Devine improvement throughout the season, earning her a starting spot during the final six games of the 2015 season. As a sophomore, Lux finished third in kills for the Bucs and helped the team finish with a 13-3 record and overall finished 22-8. She earned All-SoCon team and was named on the All-Tournament team in two separate tournaments that season. This past season as a junior, Lux came into the year named to the Preseason All-Conference team. She had a good season helping the Bucs win the SoCon championship and ultimately earning a spot in the NCAA tournament. Lux’s favorite moment these past four years is unquestionably winning the SoCon championship. As her senior year continues, Lux and her teammates have the Bucs receiving votes to enter the NCAA top 25. This season, in her fourth year, Lux is a captain, and her goal is to win the SoCon championship once again and make it to the second round of the NCAA tournament. The Bucs, and Lux, certainly have the talent and work ethic to accomplish both.